Small scale fishermen in England are struggling to retain their livelihood, while multi-million pound companies buy up the majority of fishing right, according to a new investigation by Greenpeace. The investigation revealed that just three companies own nearly two-thirds of England’s fishing quota while some fishermen hoard quota on vessels which never cast a net. Nearly half of the England and Wales’ quota is held by companies based outside the those countries, despite reforms to the EU’s fisheries policy, which encourage national governments to allocate fishing quota on social and environmental grounds. The ownership of quota by large-scale fishing firms also poses greater risk to the environment and fish stocks if more destructive fishing practices are deployed. The right to fish different species is regulated by the government, which doles out quotas to groups of companies and fishermen known as producer organisations. While these organisations are intended to work like co-operatives, the investigation has revealed that instead a handful of people control huge swathes of the UK coast. We tracked back the ultimate owners for nearly 900 fishing vessels with quota, using national and international company registries and databases to get the first true picture of who owns the British fishing industry. But the data only tells part of the picture. To understand how the quota was being held we interviewed fishermen and even examined the size of fishing boats holding the quota to see if it was feasible for that boat to catch that amount of fish. The findings are raising concerns amongst experts that traditional small-scale fishing is being choked out, leaving coastal communities struggling. “The fish in our seas are a public resource, it’s yours and mine, managed by Government on our behalf. They should therefore never be treated as just another commodity, to be bought and sold to the highest bidder”. EU rules on fishing quota allocation also suggest that it should be distributed according to social, economic and environmental criteria. The hoarding of quota risks creating a distorted market in which the price of fish stocks – and access to them – is controlled by just a few companies. “Despite the FQA Register [which lists who owns the right to stock], there is clearly still a lack of transparency regarding the actual ownership of the UK’s FQA’s. We tracked back chains of subsidiary companies to compile the first ever true picture of who owns the fishing rights in England and Wales. Three key players stood out. Plymouth based Johannes Jacob Colam owns 26% of all English FQA through company Interfish Ltd and four of its subsidiaries. The company has had issues with its health and safety record in the past. A worker died at an Interfish factory in 2013 and at the inquest two years later employees complained about health and safety standards. A spokesperson for Interfish told us: “Interfish Producer Organisation manages the fishing activities of more than 11 British vessels with the majority of these being inshore vessels operated by local fishermen – these vessels are primarily based in the Southwest, regularly landing to Plymouth and other UK ports supporting markets like Plymouth Trawler Agents and processing businesses located in Plymouth and Scotland (Peterhead and Lerwick). The Dutch owned company Cornelis Vrolijk Holding BV own 23% of English quota. In 2014 the Vrolijk’s super-trawler the Frank Bonefaas was found carrying 632,000 kilos of mackerel while travelling through restricted and prohibited waters. The company was fined £97,000 with £5,000 costs but was allowed to sell off the catch, reaping an estimated £437,000 in the deal. But to this day the company is allowed to hold quota on other boats. Matthew Cox is CEO of one of the Vrolijk’s susidiaries, North Atlantic Holdings Ltd. He told Unearthed: “The quota referred to is owned by North Atlantic Fishing Company Limited which is a UK registered company, pays taxes to the UK treasury, is based in the UK with offices in Caterham and Hull. We employ around 52 English Crew that are resident in the UK”. 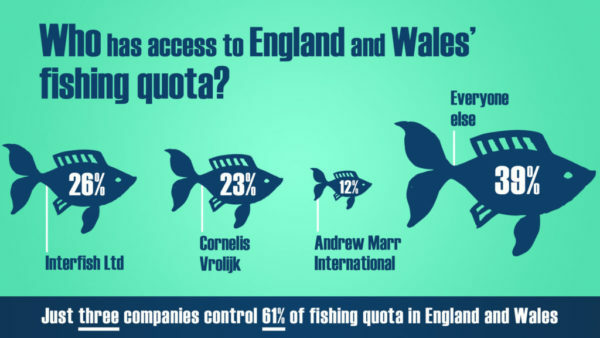 Another company, Andrew Marr International Limited controls 12% of all the English fishing quota. Using a complex series of six subsidiary companies. Though based near Hull, Marr’s (no relation to the BBC journalist) company controls 61% of the quota in Cornwall, and 49% of all quota in the East of England. We reached out to Andrew Marr International but received no comment by the time of publication. Indeed for some fish is big business. 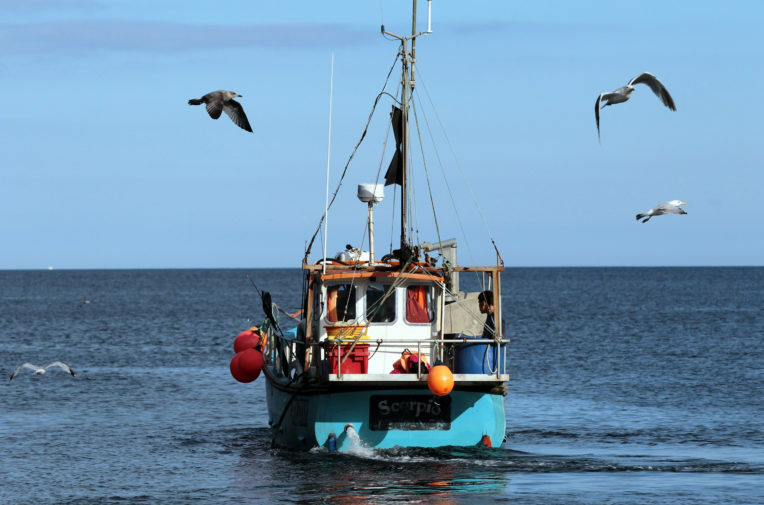 Academic Thomas Appleby from University of the West of England has recently published a paper estimating the worth of the UK fishing industry at around £1 billion. Appleby told EnergyDesk: “The UK’s fishery is a billion pounds public asset. The free allocation of quota to commercial businesses on the basis of [historical] track record is a similar process to permitting that public asset to be squatted. But for those outside the big three companies, fishing is becoming a less and less profitable pursuit. Small scale fishermen, those who fish on boats under 10 metres in length, are allocated a certain quota at the start of the month. However, according to several fishermen interviewed by Greenpeace, it can be hard to limit your catch to fit that fixed quota. And in some cases it is impossible for business to survive on such a small allowance. In desperation many small scale fishermen resort to contacting larger outfits, or those they know have FQA that they do not fish. Those owners can set their own prices and lease out quota, allowing the fisherman to catch more. However, with unregulated prices, a dysfunctional market and an unbalanced playing field, many find themselves paying so much they barely make a profit from those fish they do catch. “I’ve never leased fish on principle, and I hope I never have to. But some of the boats have had to to keep their businesses running. It costs quite a lot of money which has to come off the top value of your market price of the fish. I know some people that hold quota that lease fish, some of them hang on til later in the year when people get desperate, trying to get a better price,” he added. The prices set for leasing out FQA can vary by hundreds of pounds. To lease a tonne of cod for example, could cost from £300 to £800. The resulting catch might bring just £1100 at market, leaving a profit margin of £300 before staff and equipment costs. The situation has left some fishermen going out on boats alone because they cannot afford to pay a crew. Others have found that after boat costs they are still losing money, and have stopped fishing altogether. Fisherman Michael Newton-Smith has had to lease quota in the past to keep his three-man crew going. – work becomes stressful because of paperwork. Now it’s not the inability to catch fish but the inability to land it. So that’s massively frustrating, it’s quite depressing. The small amount of fish we did have is minuscule, as opposed to being enough to survive, it’s enough to slowly die,” he added. Last month Conservative MP Peter Aldous brought a debate to the House of Commons about whether enough was being done to allocate quota fairly. He called for the government to heed their responsibilities under Article 17 of the Common Fisheries policy which calls on allocation of quota on environmental, social and economic grounds. Climate change is the story of the century. As journalists, we have a responsibility to tell it right. But that takes time, resources and expertise – and we’re up against a constant tide of fake news and misinformation. It’s thanks to Greenpeace supporters that we can keep putting in the hours to uncover and publish the facts. By supporting Greenpeace, you’re supporting the kind of journalism we need more of, at the time we need it most.